Bennie O Morrison was born February 14,1941 on a small farm near Lexington, Georgia in Oglethorpe County near Athens, Georgia. He was reared on a farm and remained in the same area all of his life except for a few years that he spent in the in the U.S.Army. With a life-long interest in painting, Bennie first began to create walking sticks, hall trees, and tables around 1986. The next year he began working for a company that was specializing in hand painted baskets with floral designs. He would pick up baskets by the truckload and take them home to paint. Painting became an enjoyable part of his home life. By 1992 the basket company was out of business so Bennie started painting for his own enjoyment and occasionally sold an item. He established a style and subject matter depicting in great detail scenes he knew well since childhood. 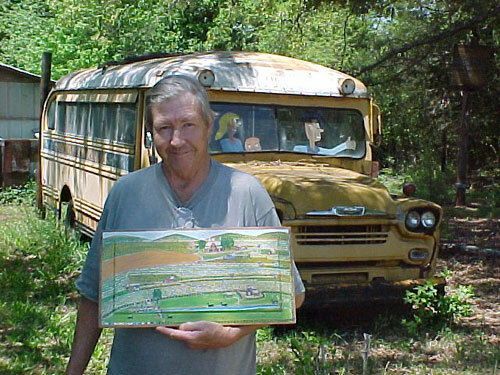 He enjoyed painting houses that he remembered with wells and “out houses.” He loved to transform ordinary found objects into his works of art. 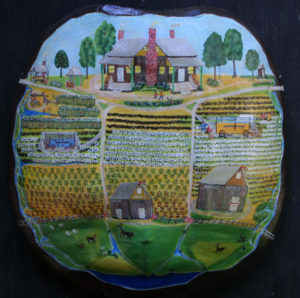 By 1995 he started to paint on bricks. Within a few years he had painted over 300 bricks covering every side of them with details. 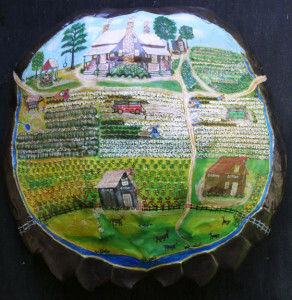 Bennie painted on whatever he had at hand through the years including turtle shells, clip-on-pins, acorns, pot lids, pressed magnolia leaves, wooden panels from old doors, tin pieces and even discarded satellite discs. Bennie lived a very frugal life with his dog, Coco, and rarely left his home. He had numerous complications from the Agent Orange that he came in contact with in Viet Nam. Bennie died December 27, 2013.